Backed by our industry experience we are offering a quality verified range of Toe Puffs and Counters which produces toes that are soft and flexible, and also resilient. Our range of these product has an excellent shape retention in wear which were highly valued among various customers for its outstanding features like high density non-woven fabric, dipping in styrene latex, excellent press resistance, flexibility, and water-resistant performance. These are fabricated using best quality non-woven toe puff and counter material, which can be access from us in a wide range at market leading prices. 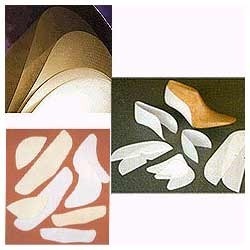 We fabricate Toe Puffs and Counter Stiffeners which is applied to shoes which is made with high density non woven fabric. These are known for its features like excellent press resistance, flexibility, and water-resistant performance. These are available in various specifications based on the requirement of the client. These stiffeners are solvent activated, heat activated and ping pong. Looking for Toe Puffs and Counters ?